From January 30 until February 8 you can reset skills and retrain your Commanders free of charge. 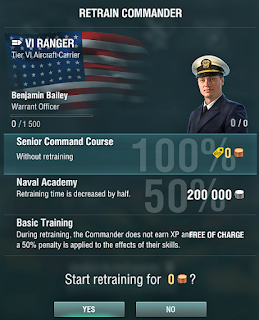 All upgrades that interact with aircraft or AA defenses will be demounted from your ships so that you can "pimp" your ships the way you like. We changed the Concealment Expert skill: ships of all types will now receive a 10% bonus. Previously, it equaled 16% for aircraft carriers, 14% for battleships, 12% for cruisers and 10% for destroyers. For battleships, this skill will no longer seem a must, allowing more flexibility in what concerns configuration choices. This change to the skill will remove weird situations when a ship with huge dimensions could get a bigger bonus to concealment than a smaller-sized ship. We'll keep a close eye on how these changes affect gameplay experience with these ships and take measures if needed. In update 0.8.0, fire duration on certain large cruisers has been increased from 45 to 60 seconds. 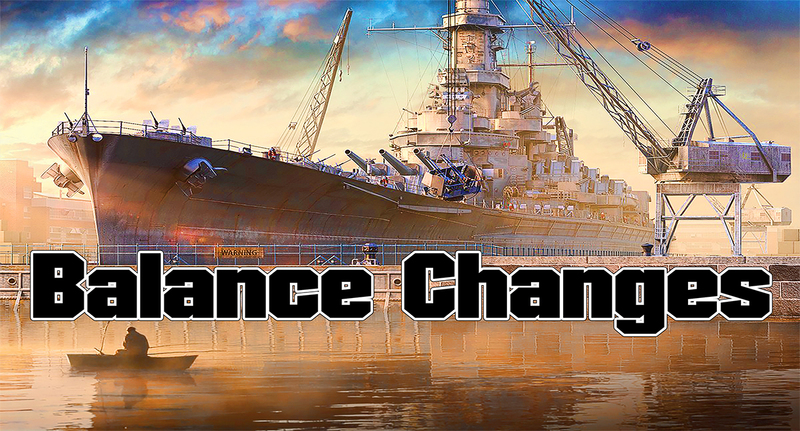 This change is systemic and affects the following ships: Kronshtadt, Stalingrad, Azuma and Alaska. The excellent armor of these large cruisers created an excessive advantage in survival during long battles. With the correct positioning of the ships, the only way to deal a lot of damage to them is through setting fires. Increasing the time required to extinguish the fire for these cruisers will improve their combat efficiency compared to conventional cruisers, keeping their distinctive features: high damage from the main battery salvo, a well-armored citadel and a large amount of hit points. The ships listed below showed a statistical lag in comparison to other ships of their tier and type. Taking into account their individual characteristics, we made a number of balance edits with the intention of increasing their efficiency. Increased the sigma parameter from 1.8 to 2.0 to achieve tighter grouping of shells inside the dispersion ellipse. The battleship will become more potent in battle due to the increase in accuracy of the guns, compensating for the specific arrangement of the main battery. This turns Kii into a battleship with more opportunities to use her torpedo tubes, elevating them beyond being a weapon of "last resort". Previously using them required players to expose the ship's broadside to enemy fire, due to the restrictive launch angles. Main Battery reload time was reduced from 32 to 30 seconds. By reducing the reload time of the ship's guns, we emphasize the role of Nagato as a battleship with good maneuverability, with her small number of accurate guns coming at the cost of armor protection. Increased the sigma parameter from 1.9 to 2.0. The new sigma will distinguish the battleship as a slow ship with decent maneuverability, good armor, and a small number of accurate guns. Reduced the main gun reload time from 28 to 26 seconds. Reducing the reload time will compensate for the small caliber of Dunkerque's main guns, making the battleship better balanced against other battleships at Tier VI. Increased the sigma parameter from 1.8 to 1.9, improving the ship's firing accuracy with a tighter grouping of shells inside the dispersion ellipse. AP fuse delay was increased from 0.015 to 0.033 seconds. Due to the new fuse timing, armor-piercing shells will detonate more often inside the citadel of armored ships, but more frequent overpenetration of lightly armored targets should be expected. Torpedo range was increased from 7 to 8 km. Increasing the range of the torpedoes will grant the French destroyer a larger window within which to launch torpedoes whilst remaining unspotted by the enemy. This will allow for more opportunities in battle to strike battleships. Main Battery reload time was reduced from 4 to 3.3 seconds. Despite the fact that the destroyer has one of the best damage-per-minute statistics for her tier, the specific ballistics of her guns often prevents this ship from realizing this advantage when engaging other destroyers. The new parameter won't change the features of her main battery ballistics, but will significantly increase her efficiency in combat with enemy destroyers at close range. "High risk, high reward" gameplay, employing torpedoes with a short range and good speed, capable of causing a great deal of damage. The comparatively safe option with a longer range, meaning that torpedoes can be fired from a greater distance, but with less damage and low-speed. Adding the "Repair Party" consumable will allow for more effective duels with enemy destroyers, making the progression to Tier X more logical.